I'm so excited to finally feature Jurianne - an amazing artist from the Netherlands with a big heart and amazingly unique paper goodies. 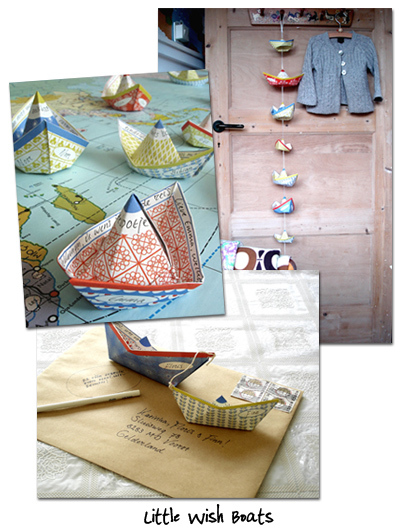 One look at her paper boats and I knew I had to have them immediately! All her products are thoughtfully made - Jurianne's work is a true celebration of life and you'll find her spirit and energy infused into each of her creations. And a big congratulations!!! 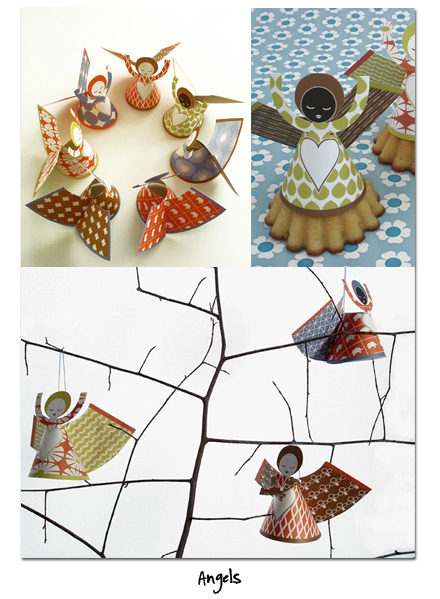 Jurianne's paper angels have arrived in the U.S. and will be available this week at www.ferrolstudio.com (a great new shop by the way). Yay! While designing I always go back to the colours and shapes that fascinated me in my childhood. So therefore my style has something vintage, with matt primary (a bit bleached) colours, but always with a sense of 2008. 2. You mention "As a little girl I was already sure that I wanted to become an Inventor of Beautiful Things." Can you recall a specific event that triggered this? What exactly happened that made you want to become an inventor of beauty? It makes me very happy when people tell me that they can see or feel the beauty beyond my little designs! There is not one particular moment that made me think that. It is just that I think I always had an eye for beauty since I was a kid. I was raised and in a big middle house built in 1450 in the Centre of an old town, Where there was always beautiful (classical) music, my parents are musicians. Besides I was attending a Waldorf school, where we painted, sang and acted a lot. Already as a young kid I was aware of the fact that beauty is not just a varnish, but something deeper that comes from within. It makes me very happy when people tell me that they can see or feel the beauty beyond my little designs! 3. You also mention that you inherited a passion for textiles, paper and patterns from your mother and grandmother. Can you share with us a little about your mother and grandmother. In shops she used to ask for old wallpaper sample books: we used them to decorate our doll's house, to make Christmas cards or we made collage-art from it! My grandmother was very artistic. Found little patches of fabric from everywhere and made these crazy wall hangings with it. She could crochet very well, never did that according to the manuals, but always from a natural intuition. In this way she turned every cushion cover into a piece of art. My mother has this great sense of colour, which makes her a good gardener too. She used to have cupboards full of textiles, ribbons, buttons and beads and never came home from a trip empty handed. In shops she used to ask for old wallpaper sample books: we used them to decorate our doll's house, to make Christmas cards or we made collage-art from it! Like her boats, you can name each angel and write a message or a wish inside each one. Perfect as gift tag for the holidays! 4. I've always wanted to visit the Netherlands. Can you give us your top 10 must visit/do. 2. Visit the beautiful little shops and boutiques in the 9 streets, the small streets between the canals www.de9straatjes.nl. I often buy clothes in the Exota shops on Hartenstraat. 3. Take a tram or rent a bike and see the lively area around the Albert Cuyp-market called De Pijp. 4. If you are in Amsterdam on Monday, get up early for the Noordermarket, it is so worth it! The marktet starts at Westerstraat with low priced textiles/fabrics, buttons, ribbons etc. and it ends around the Noorder-church with vintage stuff. All the hip crafty women of Amsterdam can be found there. 8. I am planning to visit the Audax Textile Museum in November. It is located down South in a town called Tilburg. www.textielmuseum.nl. For people like me it must be a paradise, with great textile exhibitions of my favorite textile designers. They even have a 'textile laboratory' where artists and students can have their own designs developed and printed, woven, lasered or knitted! Visitors are allowed to walk between the machines and see the fabrics being produced! 9. Everywhere you go in Holland: rent a bike (but watch the locals)! We have a perfect bicycle infrastructure, with own bicycle roads and traffic lights. 10. Don't forget to eat 'poffertjes'! It are minipancakes of 2 inch doorsnede. You can eat them in a 'Poffertjeskraam', which is a kind of temporary restaurant, alongside the street or in the park, that looks very old-fashioned. They only serve ‘poffertjes’, with lots of butter and powder sugar, yummie! 5. You're just now beginning to offer your products in the US (your products are currently available at a number of local outlets + online shops). Any early lessons that you can pass on to our readers looking to do the same? Cold calculated business doesn't work anymore, it is time for a more human and personal approach! Don't hesitate when you have a good idea or product: believe in it, take a deep breathe, be brave and go for it! Furthermore I am convinced that running a business should not be done with only the brains, but include your intuition and your heart. Cold calculated business doesn't work anymore, it is time for a more human and personal approach! 6. How do you find the energy to make such beautiful things while still working as a freelance designer, media and product stylist? How do you juggle a full-time job, a growing business and a family? Has the thought of leaving your freelance jobs and dedicating all your time to you own personal line crossed your mind? I am beginning to focus more and more on what I really want: to design paper goods that make people happy. Enthusiasm is my motor! I get so much energy from the things I do. Making designs, working as a journalist, purchasing and styling for shops, having my own wholesale business... Okay, there have been days, only last week I had to take my 2 boys with me to the printers office, where I put them between the printing machines with a pile of comic books while I am checking my latest prints on color etc. They find this real cool, being part of my work. Working at home is a great help to save energy, I don't spend hours travelling and I am at home when the kids come from school. In the meantime I seem to get a little more balance in my professional life. In the last couple of months I passed up a few projects that would have cost loads of energy and were badly paid. I am beginning to focus more and more on what I really want: to design paper goods that make people happy. 7. What tool(s) can't you live without? I wish I could say pen or scissors, but it is my computer and my printer! 8. We all have days when we throw up our hands and say "I can't do this anymore!" - what 3 things do you say to yourself or do in order to snap out of it and persevere? Oh these are so sweet and lovely and Jurianne sounds absolutely lovely as well! What a great guide to the Netherlands, I would love to visit some day. Thank you for sharing! Jurianne's work is wonderful. i love the tree of life.